Customer Service eLearning & Onsite Training Customized Engaging Customer Service Training Are your emails to customers as good as this email I got from Nik Collection? Are your emails to customers as good as this email I got from Nik Collection? Some of you know photography is my passion. Whenever I can steal away to take photos, I seize the opportunity. I had just such an opportunity yesterday. Yesterday afternoon, after wrapping up a big and successful project for a client, I sat down to edit some black and white photos from my family’s Thanksgiving dinner. Earlier this week I updated my iMac to OS X Yosemite, Mac’s latest upgrade. To my horror, and I mean absolute horror, my photo editing software was not compatible with Mac’s latest upgrade. After a couple of moments of sheer panic, I realized that certainly there was a quick fix for this. I’d either remove the Mac upgrade or I’d contact the photo editing software maker and get this sorted out. 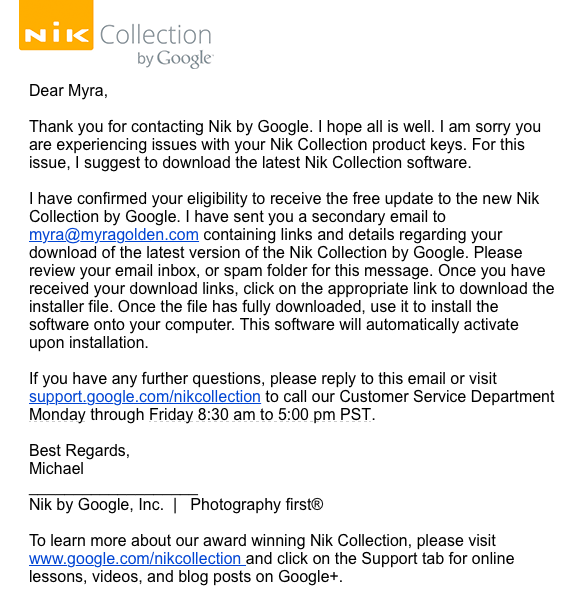 So, I emailed Nik Collection and explained my problem. Nik Software blew me away with this email response. Here’s what I like about it. It was a quick. I fully expected to have to wait 2 or 3 days for a response. So many of my corporate vendors take days to respond, so my expectation for a quick response from Nik was low. They proactively also emailed my business email address. I sent the email using my personal gmail account, but I must have also had my business email on file. Nik, perhaps thinking I might have quicker access to my business email, also emailed me at work. That really helped me out as I was sitting at my work computer when the email arrived. This literally wowed me. Instructions were clear and easy to follow. The simplicity and clarity of the instructions to solve my problem were right on the mark. I was able to instantly follow the links, upgrade my software and boom – have access to my video editing suite. There was an option to reply to the email. I don’t have to tell you how rare it is today to be able to reply to a customer service email. Companies don’t want you to email them back. They’d rather you go back to the website and fill out a tedious form. The email offered an apology. “I am sorry you are experiencing problems with your Nik Collection product keys.” I perceived this as a sincere apology and that impressed me. How do your customer service response emails measure up? Pull out one of your email responses to a customer. How does it measure up to my reaction to the Nik Collection email? Does your email surprise and delight customers? Or does it frustrate customers? Look for ways to make the customer experience over email as quick and smooth as possible. And add a little surprise and delight when you can. When you do, you’ll make someone’s day with your great emails and you’ll have people bragging and blogging about you! Next Next post: Recording an eLearning training for a client. Can I create a training for you?